As you may have noticed, I rarely read YA but I couldn't resist the premise of BREAK MY HEART 1,000 TIMES when I heard about it. It's a supernatural thriller where the scary parts are actually not the ghosts -- how could I *not* try it? The story is told from several points of view so you get to know the minds of several characters. The bulk of the novel is told by Veronica and Kirk, which allowed me to get to know them very well, but Daniel Waters also gives us some insight into Mr. Bittner, the creepy teacher, and Brian, one of the ghosts who lives in Veronica's house. The multiple angles lets us really see the world the author has created and I thoroughly appreciated it even though I didn't really enjoy being Mr. Bittner's brain. 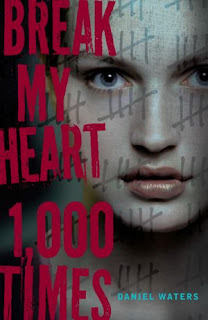 BREAK MY HEART 1,000 TIMES is billed as a thriller but it's not a fast-paced novel so be prepared for a slow boil. I generally prefer this genre of book to have more action and what you get in BREAK MY HEART 1,000 TIMES is a lot of the characters' thoughts. As such, the book felt a little slow to me, particularly in the start, and I had a hard time getting into the story. I'm glad I read it through, though, because the pieces fall into place as Veronica learns Mr. Bittern has bad intentions and as she and Kirk investigate the ghosts in their community, and the story definitely builds as you get closer to the end. While BREAK MY HEART 1,000 TIMES isn't the kind of book I'd normally pick up based on the target YA audience, I'm definitely happy I gave this book a try. I don't know if it's going to be for everyone but I'd urge you to read the excerpt below and see if it's to your tastes.